Gabriel Jesus scored on his full Premier League debut as Manchester City mauled West Ham 4-0. Sergio Aguero watched from the bench as the B#27million teenager marked a sparkling display by setting up Kevin De Bruyne's opener and then bagging one himself. David Silva was also on target in a one-sided first half, while Yaya Toure piled on the misery for the hosts with a penalty after the break. Another routine win at the London Stadium boosted City's top-four challenge after Chelsea, Liverpool, Tottenham and Arsenal all dropped points 24 hours earlier. But they were helped by some woeful defending from West Ham, who have shipped 12 goals in three meetings with Pep Guardiola's side this season. Aguero was joined among the substitutes by goalkeeper Claudio Bravo, dropped after a remarkable run of letting in each of the last six shots on target he has faced. His replacement Willy Caballero therefore proved a vast improvement simply by keeping out Michail Antonio's early drive, although it was hardly a testing effort. 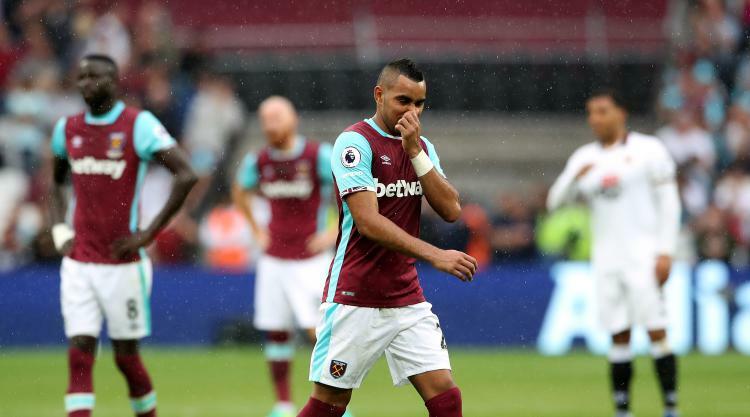 West Ham had won their previous two games as they seemed to be successfully putting the Dimitri Payet saga behind them. But City, 5-0 winners here in the FA Cup just over three weeks ago, soon began feeling at home again with Brazilian striker Jesus giving the Hammers the runaround. They took the lead in the 17th minute thanks to a dreadful mistake by Aaron Cresswell, who passed the ball inside straight to De Bruyne. The midfielder burst forward unchallenged and played a one-two with Jesus on the edge of the West Ham area before burying his shot past Darren Randolph. Four minutes later City their doubled their lead, and again it was all far too easy, Leroy Sane skipping past feeble challenges from Sam Byram and Jose Fonte before rolling the ball across goal for Silva to tap in. Cresswell had the opportunity to make amends for his error when he was put clean through by a stunning cross-field ball from Andy Carroll. But the left-back's first touch was poor, and his second was downright awful as he shanked his shot high into the air and over. Instead, six minutes before half-time it was three with West Ham yet again proving to be over-generous hosts. This time Pedro Obiang gave the ball away, Sane's diagonal pass put Raheem Sterling in behind and the winger unselfishly squared for the livewire Jesus to deservedly open his City account. Three became four 20 minutes into the second half when Fonte, enduring a thoroughly miserable debut, tripped Sterling in the area and Toure tucked in the penalty. Victory moved City level with Liverpool in fourth, and just a point behind Spurs and Arsenal, but they are still 10 adrift of leaders Chelsea.